Winter’s masks draws with guise, as subtle beauty meeks the wise. Slushy wet, slips mushy brown and swamps the dirty tainted ground. Vanilla flakes drift and tease, breath of crystal yet too warm to freeze. Patchwork place new boundary now. Soft and lacey beanied hat pulled down. Scarf breath wet defeats the plan. If others still do, so will this man. Silent snowman holds his pose. Pebbled buttons stray out of line. A legless creature only one day his time. From fern fresh yearling to oak tailed old. No babbling gossip, no lager louts. Who says no man hibernates? When winter comes, so close his gates. Yet within a castle walls the human man they call free. Is drawn to look upon an outdoor winter scene. For although he sees cold, he also sees serene. For in his heart he too once felt cold, melted and wet and sometimes so quickly so old. Yet he sees now the beauty the perfection of all. 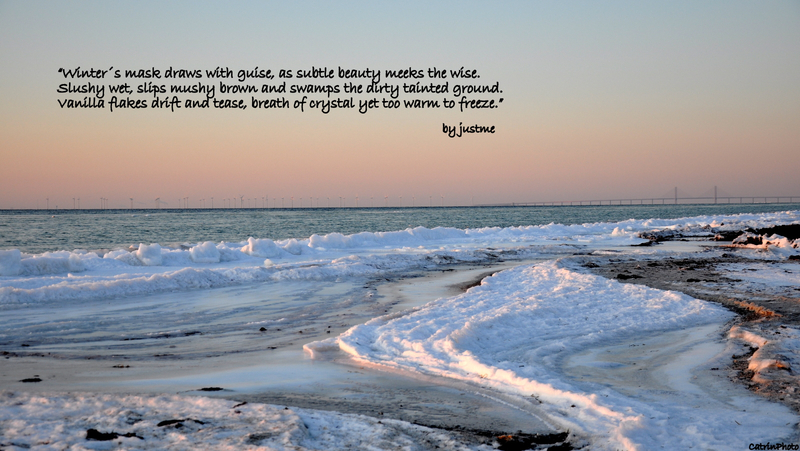 This entry was posted in Life, Nature and tagged Presence, Snow, Winter by Michaela. Bookmark the permalink.